💫 My #1 Income Opportunity Online with BONUSES! 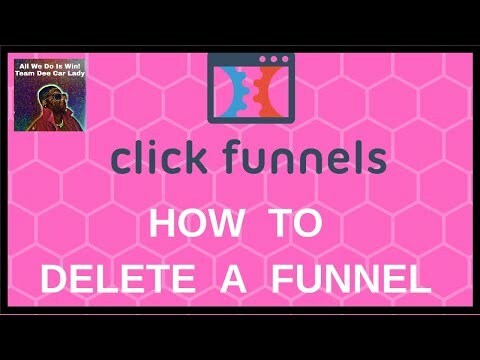 Clickfunnels tutorial: How to Delete a funnel in clickfunnels. In clickfunnels, deleting a funnel is actually called archiving a funnel. You can’t completely delete a funnel in clickfunnels, but archiving will achieve the same results. It’s important to know how to delete a funnel in clickfunnels because you have limited funnels and pages to use in the basic plans of clickfunnels. Deleting or archiving a funnel in clickfunnels will free up some space for you to make more funnels that you really need to use immediately. You can always restore a deleted or archived funnel in clickfunnels if you want to use it at any time in the future. Clickfunnels is one of the top funnel systems used by top marketers today. Knowing how to delete a funnel in clickfunnels is imperative for any serious online marketer today. Get my FREE training on how to get Free leads in your business in less than 30 minutes! Let’s Take This Ride To The Top!